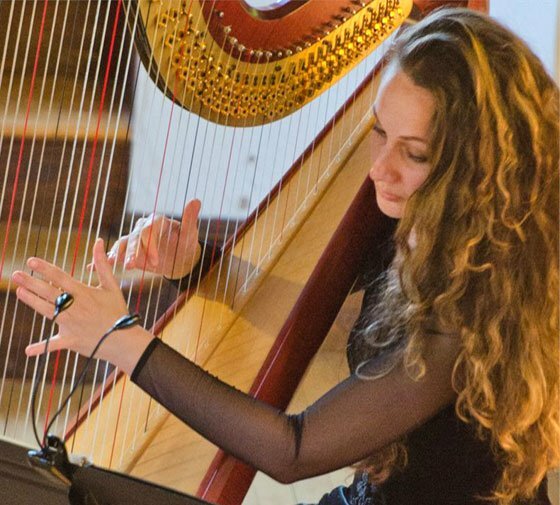 The 2012-13 Ashmont Hill Chamber Music series went out in style on June 9th with a program in Peabody Hall at All Saints Church, featuring works in which harp rather than piano provided the principal accompaniment. In addition, the concert offered some delectable vocal works from the Romantic, Modern and Post-Modern periods and a premiere from the pen of Michael Gandolfi. The first of the eight works on the program was a song rarity from early Romantic opera composer Gaetano Donizetti, the Romanza: j’aime trop pour être heureux, with mezzo-soprano D’Anna Fortunato, violist Michelle LaCourse, and harpist Ina Zdorovetchi. As with Rossini, Donizetti’s non-operatic works have an operatic cast to them, and this ballad on the torments of jealousy is no different. As Fortunato explained before the performance, the text (by an unknown author) is set from a male point of view and was intended for baritone. 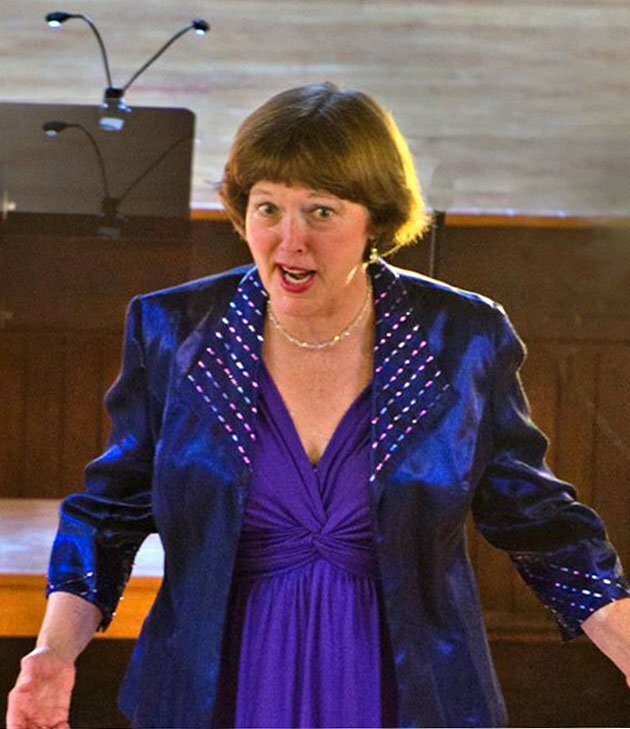 She nevertheless utilized the formidable theatrical gestures, facial expressions and vocal nuances that have made her one of the country’s most distinguished recitalists to convey both sincerity and irony in this mostly lightweight number. The harp part here, though apparently original to the piece, was rather pianistic in construction, while the interstitial viola part switched between violinistic decoration and cello-like bass support. The performers expertly carried both parts. One of the hazards of programming unusual instrumental combinations is that one is likely to require the aid of arrangers to supplement scanty original repertoire. In the case of Ravel’s Sonatine, a popular piano work from 1905, the assistance couldn’t have come from a better source: the eminent 20th-century harpist and composer Carlos Salzedo, who brilliantly and completely idiomatically scored it for flute, viola and harp. In three movements, the first two short and the finale more substantial (the first movement, contains only 84 measures, the last nine of which cost Ravel a prize offered for a piece of 75 bars or fewer). The middle minuet demonstrates French composers’ waywardness with that form, in the sense that its liquid rhythms would not lead one very securely on a dance floor. The finale is more flamboyant and virtuosic. Linda Toote was spot on in the flute part, as was Dzorovetchi in Salzedo’s ingratiating and multi-hued harp scoring. LaCourse, while perfectly accurate and secure, lacked enough projection to keep proper sonic balance with the others. Another rarity followed, at least for those of us not intimately familiar with flute repertoire. François Devienne was a flutist, bassoonist, composer and pedagogue who bridged the ancient régime and Revolutionary eras with his head intact, and was eminent enough to have his portrait painted by Jacques-Louis David. A digression: Devienne’s name translates in German to Franz Wiener, but that was never his name, although Franz Wiener was the birth name of the French playwright and librettist (for Massenet and Hahn) Francis de Croisset, which we mention just to forestall any confusion among collectors of French cultural trivia. Devienne’s Duo in C, op. 5 no. 5, for flute and viola, is an amiable but undistinguished essay with a first movement full of Classical tropes, and a final theme and a few variations that impose standard passagework on a fairly nondescript theme. Unless Devienne was a rhythmic radical for his day, which we sort of doubt, there were some ensemble issues at a couple of points in the first movement, but otherwise nothing was out of place or unexpected either in the music or the performance. Another arrangement of a Ravel piece ensued, this time of his Five Greek Folk Melodies, with the arranging by Zdorovetchi. These miniatures, harmonically evoking the Satie of the Gnossienes and the Gymnopédies but not often to our ears very Greek in flavor except for the deliciously modal fourth one, received a thoroughly enjoyable performance from Fortunato and Zdorovetchi, the former applying a high emotive and musical gloss to the sometimes gnomic (French) texts, and the latter accompanying mostly discreetly, but with appropriate vivacity in the finale. The first half of the program ended with the premiere of Michael Gandolfi’s Preludes and Fantasy for solo harp. The composer summarized from the stage his thorough program note by stressing the issues confronting a contemporary composer, even a neo-tonal one like himself, in writing for a diatonic instrument like the harp. The second of the two preludes, which he conceived as a thoroughly chromatic one, was therefore the most technically challenging to bring off, for the composer as well as the performer, requiring some literal fancy footwork on the pedals that inflect the pitches of the strings. In the event, the difficulties were surmounted with no evidence of stress, and the work, whose first movement is rhythmically driving, the second a kind of chorale-lullaby, and the finale in the European tradition of lovely filigrees and arabesques, should find ready acceptance by players and audiences. It almost goes without saying, but Zdorovetchi’s performance was impeccably fluent and directly communicative. The second half began with another little gem, this from the late Earl Kim, his Now and Then (1981) for voice (scored for soprano, but as Fortunato said “a mezzo soprano is just a short soprano, so here I am”), flute, viola and harp. Kim set four haunting texts by Chekhov, Beckett (reprised as the fourth movement) and Yeats, with his characteristic lapidary lucidity and economy. In addition his cycle displays a gracious lyricism that all the performers exploited, even though the instrumental parts were typically spare—think Barber meets Webern. Fortunato was radiant, most notably in the Yeats finale, and every note from everyone was pregnant with unspoken significance (the impetus for the cycle was Kim’s long-ago aerial reconnaissance flight over Nagasaki the day after the bomb dropped). This piece alone was worth the price of admission. Another short work next, “Prayer for Peace” by Francis Poulenc. Setting a 15th century poem of supplication to the Virgin, it was an exercise in finger-crossing in the wake of the Munich Pact of 1938. Churchill knew better, but no one could be blamed for hoping. Poulenc’s music was not much in keeping with his usual idiom, not even harmonically, except for a few notes at the end; there’s a whiff of Fauré about it. Fortunato and Zdorovetchi (who we presume to be the uncredited arranger of the piano part) maintained a dignified simplicity of utterance. The ensemble of flute, viola and harp is an artifact of the Debussy sonata of 1915, just as the trio of violin, horn and piano owes its existence to Brahms. The Debussy is a perennial mystery, for its gorgeous sound world and its freedom from any kind of recognized formal structure—even the so-called minuet of the central movement is purely notional. These mysteries, of course, invite all potential performers to have a go at it. Challenging though it is to shape Debussy’s silken sounds and episodic presentation into a convincing musical argument, the work is often enough performed that any new interpretation needs to pack a wallop or switch on some lights. The reading from Toote, LaCourse and Zdorovetchi was respectful, lively in places, accurate and committed, but we left without any particular revelations.